i never had a corn dog til i was over 20- not overly popular up here, and its not because we are/were food nazi's either.. I love hot dogs, and only buy natural casing..I love the crunch! And will not click on the links listed above!! I enjoy em, and will continue to do so..
Heck it can't be any worse than what happens in some restaurant's behind closed doors.. I don't wanna know and that's that! you put honey on your hot dog? We used to slice the hot dogs into rounds, brown them, and pour in some honey or maple syrup, then simmer for a few minutes. Delicious! Usually was served with macaroni & cheese. ill have to try that!! Those are some big hot dogs. Big dogs will work great for honey hot dogs (or maple dogs, whichever). You'll have to let me know what you think. 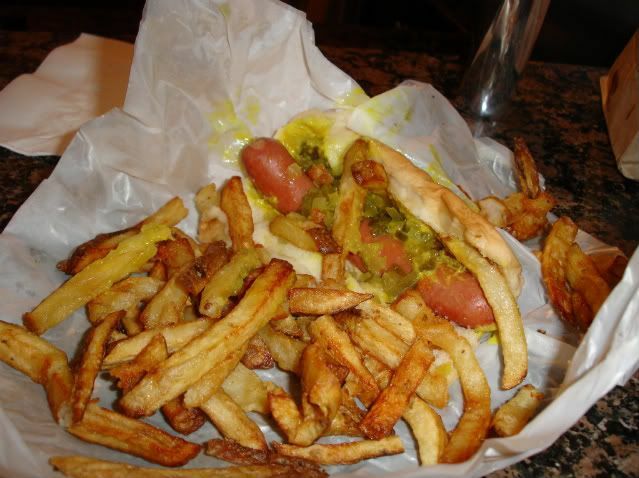 Natural asking Vienna hot dog and fresh cut fries from 35th St. Red Hots, IMO the best hot dog stand in Chicago. On the South Side a couple of blocks west of Sox Park. When I did eat hot dogs, it was the kosher Hebrew National ones all the way. Yes indeed! The only dog for me! Sodium Erythorbate is an antioxidant which is chemically and structurally similar (almost a direct analog of) to sodium ascorbate. Sodium ascorbate = Vitamin C. Some people are allergic to it (although that is quite rare) and may wind up with some of the side effects listed if they eat it in large quantities. Acute toxicity levels are less than that of common table salt. Any real study shows that the measured effects on human health are negative to none at levels 100x that of ordinary consumption. Get your facts straight and stop listening to all of the sensationalist drivel.